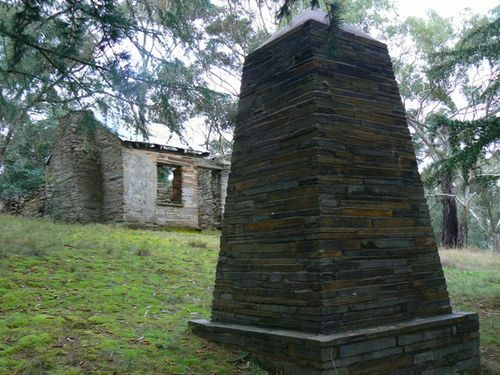 A slate obelisk erected in 1931 commemorates the discovery of gold nearby. The gold discovery precipitated the rush to the Mount Alexander goldfield which in turn provided the main impetus for the great Australian gold rush. The monument is also known as the Mount Alexander Goldfields Monument. One of the many features connected with the annual reunion of the Old Castlemaine Schoolboys Association on Saturday was the unveiling of a memorial cairn erected at Specimen Gully, Barker's Creek to mark the spot where gold was first discovered at the Mount Alexander gold field by Christopher John Peters, on 20th July, 1851. The cairn is constructed of Barker's Creek slate with a suitable inscription on polished granite, and stands 9 feet high. It was unveiled in the presence of a large representative gathering by Mr. Owens the donor, who is a former resident of Barker's Creek. Others who took a part in the ceremony were Rev. C. Zercho, president of the association; Senator Lawson, Mr. J.E. Satchell, M.L.A., Cr. J. B. Warren, of Metcalfe shire, Mr.R. Portwine, chairman of Barker`s Creek school committee, and Mr. E. Taylor, secretary of the Pioneers and Old Residents Association. On the site adjacent to the cairn are the remains of the old slate building, which was the home of Mr. John Worley, one of the men associated with Peters, and inside the building which is being preserved from further dilapidation for its sentimental and historic value a scroll encased in a metal frame has been placed, setting out in detail the early history of Mount Alexander gold field, obtained from records in Government departments. The Age, (Melbourne), 12 October 1931.